Woohoo! 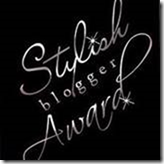 I got a Stylish Blogger award from Michelle at This and That about Kids. Be sure to stop by her blog!! Thanks Michelle! 1. I am married to a great man and we have 2 wonderful sons. 3. I taught high school math for 8 years before staying home with my babies. 4. I would love to teach at a college in their education department so I can teach teachers. Wouldn't that be fun?! 5. I have two tattoos. and promised my dad I wouldn't get anymore. :)My sisters and I have matching tattoos on our ankles which I think is kind of neat! 6. I love love love to dance even though I am not the best dancer in the world. I taught dance for two years (along with math!) and didn't really like teaching it. I also coached cheerleading and enjoyed working on pep rally dances the most! thx for the award. so fun to see other moms that enjoy your same activities.